The absolute worst part about starting a new blog is not just the knowledge that you’re adding to an infinite and growing number of projects generally doomed to failure, but there’s the added apprehension about posting any idea to the vastness of the internet – am I not just adding to a lot of pollution and noise? And who am I to say anything at all? So much of what we see, regardless of the medium, is so often the ramblings of mad man or a half-cocked idea with a half-assed implementation. Then there’s the troublesome issue of the title: it needs to be intelligible, remarkable, perhaps even clever or witty. Can’t be presumptuous, can’t assume to pretence, can’t be monolithic etc. Why is it that the medium which is the most open and available means of communicating original thought so quickly mired in the hang-ups and details generally saved for the end with regards to other media? If you can retain your optimism after the initial delays of having to come up with a catchy name off the top of you head, perhaps you recognize the form and function of this medium is inherently evolutionary, at least if its done right. Isn’t it a joy to see the development, the permutations, and the triumph of doggedly pursuing your intent to spread your own personal gospel? And aren’t the naysayers who whip out catchphrases like: ‘well that’s been done’ or, ‘kinda arrogant, no?’ simply incapable of getting past the first hurdles? I don’t know exactly how and where this blog will go, but I know how and where to push, so perhaps I’ll push it into somewhere known and meaningful amongst the vast debris of an infinitely growing web of thought. I don’t consider the current working title to be particularly attractive, and generally speaking it would be an unknown word to most English speakers – so be it, there’s a story there, and in part it relates rather well to what I think I’m trying to accomplish. Simply put Kondiaronk was a diplomat, perhaps one of the first in recorded Canadian history. He was a Huron Chief who died in Montréal in 1701 of the dreaded smallpox. When he left to attend the great conference he helped create that fateful summer, he knew the risk to his health was high, and that he would likely not return. 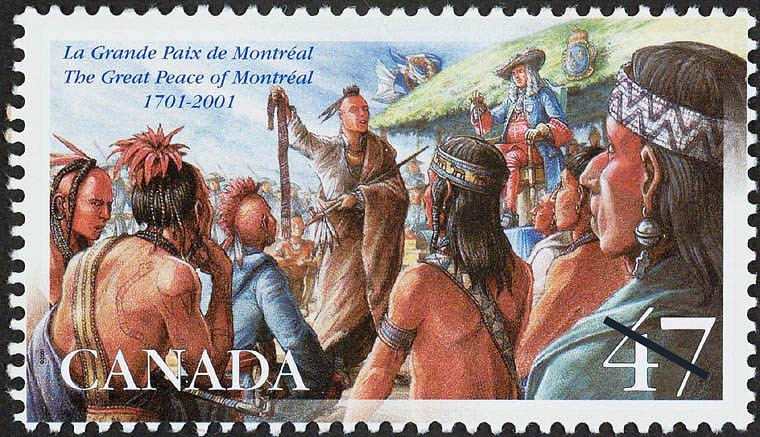 About 1,300 other Aboriginal delegates travelled to Montréal that year seeking the same peace, the same general agreement between civilized and sovereign peoples – they knew whatever the risk to their personal health via European-borne diseases, there’s was a mighty and vital task. And in the end, after several days of negotiations, the colonial government of New France signed a peace treaty with 39 Aboriginal nations in what is today Canada and a good portion of the North-eastern United States. This was a meeting between peoples who held each other in high esteem – they considered each other as equal and free men and had no reason not to. They would conclude the Great Peace of Montréal with much rejoicing; though they did not know it at the time, they would have participated in the first documented example of participatory, representative government in Canada, a glowing example of early federalism. What strikes me is how innovative it was for the time. It was original thinking, very creative and profoundly unique – the logical development given the circumstances and context of those deliberate and delicate first moments of contact. Two groups of peoples from extremely different backgrounds, cultures, languages and societies came into intimate contact with one-another and produced original solutions to complex socio-cultural problems. A new people were being born through synthesis. So this blog aims to look at our historical and cultural identity for solutions to current problems in Montréal, pertaining to design, culture, society and sustainable development, in the broadest sense of those terms. I may as well identify it off the bat – I’m certain I’ll be able to sum up this blog in a sentence several weeks from now, but I’m not there yet. Sorry for the vagueness but that’s the humanity of the medium, it needs to be forgiving, a little loose.